I've been making David little plates of various items to go with his Scotch for dinner the last few days. We've decided that if I was ever a cook, I would be on the garnish station. I don't actually enjoy cooking, but I do enjoy putting different flavor combinations together and arranging them nicely on the plate. Left to right: Mozzarella with salami on a toothpick, red pepper and artichoke bruschetta on water crackers with pimento and oregano, herbed goat cheese and salami with parsley, black olive tapenade on a water cracker, black diamond cheddar cheese spread with salami, salmon pinwheels on cracker with cream fraiche, about 8 varieties of olives, a few mushrooms and a caper berry, caviar with cream fraiche, pickle, salami, habanero goat gouda and Beecher's just jack cheese on toothpicks, toasted pecans and lastly, Bowmore cask strength Scotch in a teacup. 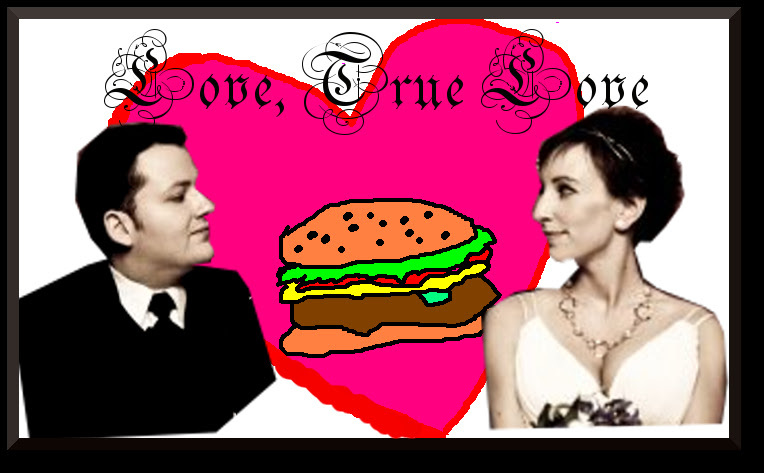 I make good use of our wedding photos and my rudimentary Paint and Gnu image manipulator program (GIMP) skills. So now I have a subscription to Culture, the current issue featuring a spectacular centerfold of an artisanal aged cheese wheel, instructions on how to make my own ricotta cheese and an in depth look at goat cheese production and how it is making a comeback. I’d been anxiously keeping an eye on the weather all week, watching in dismay as the forecast was for thunderstorms and rain and more rain on Sunday and Monday. In the end, I decided not to let something I could not change, like the weather, stand between me, beer, BBQ, and a good time. I packed us umbrellas and resolved not to worry about rain. We arrived at the Hyatt around 3:00 in the afternoon. We’ve now stayed at both the Hyatt and the Millennium, and we can undoubtedly say that the Hyatt is waaaay better. Last year, checking into the Millennium took over an hour. The Hyatt took 5 minutes. We checked into our room and got ready for our first go-round with taste. We planned to meet 5chw4r7z and a few others down there in an hour or so. I know I promised lots of pictures, but unfortunately that’s not the case. Why? Because, frankly, I was preoccupied stuffing my face. And drinking. You can see a few pictures on 5chw4r7z’s taste of Cincinnati blogpost. I discovered that it is very difficult to take pictures with a beer in one hand and baklava in the other. I decided to keep the camera safe in the bag most of the evening. That way, I wouldn’t get it all covered in barbecue sauce or worse, drop it on the pavement. I had a few things I wanted to try, but first stop was the Spaten tent for some Optimator. Next, I tried the Coconut walnut encrusted shrimp from Vitor’s. Honestly, I was taken aback that 2 medium sized shrimp were $5.00. They were OK. I think that their French toast was the star of the show. While we were sitting down ruminating about the OK shrimp, a petitioner came up asking if we would sign his petition to put the Casino deal back on the ballot. He then engaged us in a conversation about the evils of our government system. David and I looked at each other, trying to keep a straight face. We almost made it, but when he started to mention the Illuminati and conspiracy theories, I lost it. David stopped for some sushi—a Cincinnati Roll— at Kyojin, which I tried some of. It was OK. He also got the tempura shrimp, which I enjoyed. I wanted to try some ribs, so I grabbed Montgomery Inn to start. They were tasty, but messy. David stopped at La Petite France to get some escargot (yuck). We then went over to Wertheim’s to get David a mettwurst and wait for 5chw4r7z. I had a potato pancake, which was very good. It was not overloaded with onion, a complaint that I usually have with potato pancakes...but it needed something. Salt, maybe. We ran into Westender, who hung out with us most of the night. I also had the pleasure of meeting Julie of Winemedineme, and her burger and croissant reviewing boyfriend, Terry. David went back to the room to take a shower and a nap. I knew that if I went to sleep, I would not get up, so I opted to stay and continue to eat and drink. WE and I went over to the Café Istanbul booth to try their lamb and chicken kebabs with basmati rice. The lamb was OK. It was not seasoned, so it was very boring. The chicken, on the other hand, was very good and juicy. Andy’s makes a good Shish tawook, and I like their marinade, but the chief complaint I have with them is that their chicken is always dry. It was getting dark at the point, so I texted David to wake up and come back. We met a few of our other friends and went back to Spaten for a franziskaner weissbier. I wanted something lighter and fizzy. 5chw4r7z also had a few as well. I was starting to get pretty scatterbrained—and full—at that point.I tried a bourbon slush from one of the booths, found it too sugary. I also had some baklava from Mythos. It was getting later, so we started hearing toward the hotel to crash. I picked up some roasted almonds from Strasse Haus, which I shared with 5chw4r7z while coaching him on the proper way to say franziskaner weissbier. We both were pretty far under the table at that point, so I am sure we made a funny picture as we proceeded down the street. "er...No. Here. have some more almonds." We made it back to the Hotel without incident, and despite our substantial beer consumption, felt fine the next morning. We woke up on our own at around 9 AM. We packed up and headed out of the hotel at around 11. Taste didn’t start until 12, so we had an hour of watching the set up. It started to sprinkle a little, but we had our umbrellas. Taste kicked off at noon. David got a franziskaner weissbier, and I started in pursuit of a dream I’ve always had. Yes, ladies and gentlemen, I had a dream. A dream of having white zinfandel, French toast and BBQ for breakfast. And I saw that dream turn into reality on Monday morning. So I say to you—never give up on your stupid, stupid dreams. I enjoyed my white zinfandel, it was very refreshing. We also got 2 “buck-a-bone” ribs from City Barbecue. We had some Chicken Satay and Crab Rangoon from Bangkok Bistro. I had never had crab Rangoon before. I’ve been missing out. It was delicious, thought I could have done without the sugar in the cream cheese filling. David tried the fried oysters over dirty rice from Washington Platform. They were pretty spicy. David saw this display at the Sensodyne booth. We were both disturbed. We also met one of my coworkers and her roommate slightly outside the taste area to see their new puppies—6 week old toy rat terriers, Hercules and Shayne. They were adorable. We also stopped at Taz, where David got the chicken Kabob sandwich. It had pickles, tzatziki sauce, tomatoes and juicy chicken. He enjoyed it a lot. I tried the crab cakes, which I liked; and the sweet potato fries from Behle street café. They were good, but Dilly Deli beats them…just barely. After the initial line had cleared out, we headed for the French toast from Vitors. I had heard about it before the Taste, but never made it over the restaurant to try it. I thought it was really, really good. It made up for my meh shrimp from the day before. We met my Mom down at taste for a little while and walked up and down to try and figure out where we wanted BBQ. David spotted Jeff and Allison walking in the opposite direction, and we chatted for a few minutes. We ended up at Eddie’s BBQ. While we were ordering pulled pork sandwiches and ribs, it began to pour. Despite our umbrellas, we did get pretty wet. We sat in the Westin and ate our Eddie’s (we were not impressed. I think city BBQ or pit to plate wins the Taste of Cincinnati BBQ challenge.) We decided we should call it a day. It was still raining, so we got a cab from the Westin valet area and came back to our apartment, and a very hungry kitty. I thought taste of Cincinnati was a pretty good event, and I can’t wait for Oktoberfest. I do have one question, though. Can someone please explain to me why at taste of Cincinnati there was no goetta? There better be a good reason. David and I take our festivals very, very seriously. We’ve been taking it easy the past two weeks with eating out, but we’re about to make up for it. I've also been going to the gym for the last three days. That's a big deal for me. I hardly went all winter. In case you have not heard, Taste of Cincinnati is coming up this weekend and runs through Saturday, Sunday and Monday. Saturday and Sunday the nommable delights begin at noon and run until midnight, and Monday everything starts at noon and ends at 9. David and I live a mere 15 minutes from downtown, but for Oktoberfest and Taste of Cincinnati, that’s 15 minutes (and a car trip) too far. So we booked a hotel room on Sunday night at the Hyatt, which is offering a discounted rate for this weekend. If you check the taste of Cincinnati’s website, you can get yourself a handy map and also a list of what vendors are serving and what the prices for everything are this year. I have already highlighted mine in order of preference. With so much food around, you must plan accordingly if you want sample all your desired dishes and not run out of tummy-space. Apparently there is also a stroller path this year behind the booths, which is nifty. I am all for not having my foot run over by strollers. We’ll be wandering around taste of Cincinnati on Sunday afternoon and evening and Monday afternoon, stuffing our faces with delicious food, taking lots of pictures, drinking lots of beer and grinning like idiots. If you spot us don’t be shy, come and say hello. Send us an email if you want to meet up on one of those days. See you there! I like to take walks at lunch. It’s nice to get out of the cubicle, away from my phone that never stops ringing and crowded inbox. It gives me some time to think. I’m mostly left alone; although I get hit up for change a lot. I vary the route, sometimes traversing over the Roebling suspension bridge and around the Ascent. That’s the route I chose today. I was deep in thought when I reached the Kentucky side of the river, and saw a disheveled looking man smoking a large, hand rolled cigarette standing by a lightpost with two duffel bags. I had the busy road to my left, and a sharp drop off to the river to my right. I couldn’t avoid him. Steeling myself to utter my often repeated line “Sorry, man, I don’t have any cash.” I began to walk towards him. He looked up and saw me, beginning to dig in one of the various plastic bags by his duffels. I had no idea what he was doing. Was he looking for another cigarette? Was he going to try and pull the bag over my head and cart me off to a desolate location? I hoped he didn’t have poop in the bag. That would be unpleasant. I was totally unprepared for what came next. It was none of those things. My brain was not processing the situation. My hand took the dollar. I tried to hand it back. The whole situation was really odd. Someone who I perceived to be homeless, giving me a dollar. And then there was the whole thinking-about-you thing. I don't remember ever seeing this person before. What was that supposed to mean? Those thoughts spinning around in my head, I tucked the dollar in my pocket and continued walking around the Ascent. It took me less than a minute to get back to the lightpost. The man and his duffel bags were gone. I looked all around for five minutes, but I couldn’t find him. I checked my pocket. Had I been hallucinating? No. The dollar was still sitting in my pocket, making no sense. I walked back to work thinking about a lot of things. Why did he give me the dollar? Who was he? And where did he disappear to? Am I supposed to get something out of this? What should I do with this dollar? I really don’t know what to do with the dollar. The whole situation was really strange, so I feel kind of like I should do something special with it. Should I make a dollar donation to a charity or pay it forward somehow? Give it to someone sitting on the street corner? Buy the suggested soda? For now, it’s just sitting on my desk. I keep giving it strange looks. What do you think I should do with this mysterious dollar? I was sitting at my desk on Monday morning, muddling through permanent parcel numbers and postal codes with the Butler county Auditor when I got my Dad’s email. I called David and asked him if he wanted to go to the Circus in Loveland. The Kelly Miller Circus was visiting, which is a smaller, one ring circus. They were setting up at the Loveland high school. David, ever the skeptic, ventured that it would be one guy with a few dogs jumping through hoops. I won out in the end, and told Dad to get us tickets. On Friday last week, we headed up to Loveland to see the circus, my second, and David’s first ever. They led with their strongest act, in our opinion. Tigers! "Hey Bob, should we eat Casey today?" "Meh, maybe later. I saw him down two burritos for lunch. We should wait a day or two." Four adults and one adolescent tiger were wheeled up to the ring and hopped out of their cages and onto their little platforms. Dad had upgraded our seats to ringside, so we were in the front row. "Aw, why do I just have to sit here and watch?" The Tiger Tamer, Casey McCoy, had two things, a bullwhip in one hand, and what looked like a large kitty toy in the other. When the tigers got cranky—which was often, they were pretty snarly—he would flick it in front of their faces to distract them. OMG, they caught Shere Khan! The Ringling Brothers circus is very polished and you’re usually sitting pretty far away when you attend. Sitting ringside next the single ring set up on the school parking lot, 6 feet away from 5 tigers was pretty exciting. The sense of peril was very real. You really can’t bribe tigers with peanuts. Maybe nachos, but they’d probably be more interested in your arm. We noticed that the tigers, though snarly, postured themselves a lot like housecats. Big, grumpy housecats. That can roar. And eat you. I will not roll over, I wont, I wont! The next act was juggling. Hats, balls, and ping pong balls. After that, a balancing act on something called a Rola Bola, featuring Fridman Torales. I’m not sure how this guy did it. He must do a lot of yoga. Sure enough, David was right, and there were dogs jumping through hoops. But he did not predict them pushing each other in the doggie bassinet. Of course, there were clowns, along with a ringmaster, John Moss III, that I found to be a mix of Stephen Colbert and Bob Saget, mostly Saget, a little Colbert. There was also the hula hoop master, Deyanira, who I respect because I can’t even hula one hoop. I told Dad I wanted a lightsaber, and he complied during intermission, bringing me back a green one. The elephants appeared which we did not ride because they were kind of smelly and kept farting. They held eachother’s tails, which I thought was very cute. One of them sneezed all over the people at the other side of the ring, which David caught and I sadly missed. And then, what David said was the best act, a dog in a mini elephant suit. There were some acrobatics, and then a motorcycle on a tightrope with a trapeze. alright, who let Peter Pan's shadow in here? that guy's nothing but trouble.